There were 16 participants: Doug Harebottle, Tony Archer, Les Underhill, Dieter Oschadleus, Rick Nuttall, Penny Palmer, Loutjie Steenberg, Graham Fiford, Ian Sinclair, Arnia van Vuuren, Sue Schultz, Luis M. Arce, Niall Perrins, Alex Zaloumis, Crystelle Wilson, and Graham Pringle. 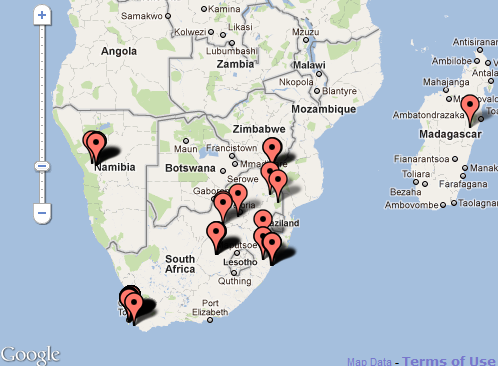 Records were submitted from South Africa, Namibia and Madagascar (see Map). To see all the records go here. This event forms one of the events in the ADU 20th anniversary celebrations.